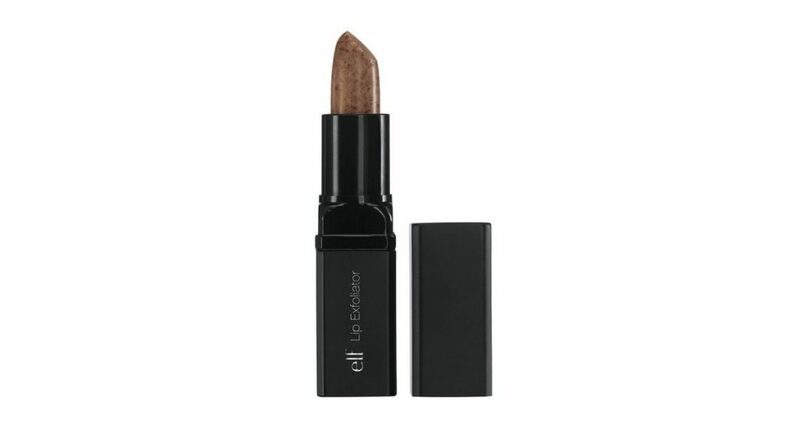 The ELF Lip Exfoliator gently exfoliates lips for a conditioned and revitalized feel. This product is made from many highly regarded natural ingredients, the main actives being sugar for exfoliation and oils for moisturisation. Sucrose is a common and natural form of sugar. It is a natural humectant, meaning it effectively draws in moisture to hydrate skin. 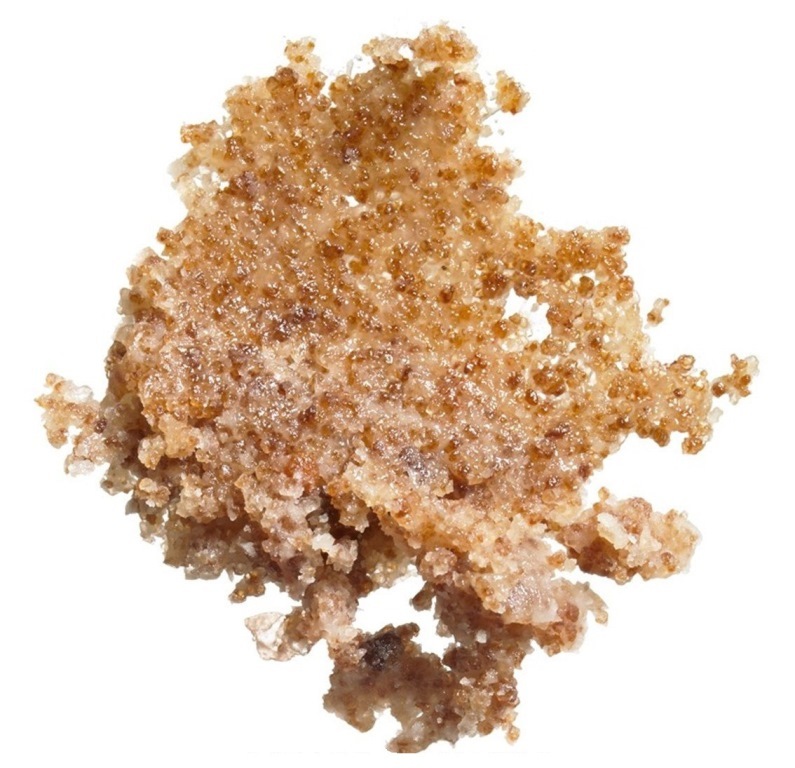 Furthermore, sugar is a natural exfoliant, a source of glycolic acid, an alpha hydroxy acid (AHA) which helps to turnover skin cells for a younger appearance. Grape seed oil is extremely rich in beta-carotene, vitamins D, C and E (anti-oxidants) and also essential fatty acids like palmitic, stearic and linoleic acid which have proven anti-wrinkle, pore and scar reducing properties. Grape seed oil effectively moisturizes to balance both dry and oily skin. The antioxidants, omega-3 fatty acids and anti-inflammatory agents in Avocado Oil help to calm, strengthen, replenish, protect and heal skin. Avocado oil comprises 63% Oleic acid that enhances skin permeability, compared to coconut oil with 5-10%. The oil of an avocado penetrates the skin but is also thick enough to serve as a protective barrier. Shea Butter is an excellent source of all-natural vitamin A, effective at treating blemishes and wrinkles through the promotion of cell regeneration and collagen production. It is extremely moisturizing and hydrating delivering an immediate smoothness and softness. Jojoba Seed Oil is made of essential fatty acids and antioxidants and mimics our skin’s natural oils and thus can penetrate at a deep level for effective moisturisation. It can help to repair and regenerate skin cells, fight premature aging and brighten skin. Jojoba Oil is a naturally gentle, all round powerhouse oil able to balance oily skin, soothe sensitive skin, hydrate dry skin and heal acne prone and problem skin. Remaining ingredients are included because of their binding, conditioning and fragrance properties. 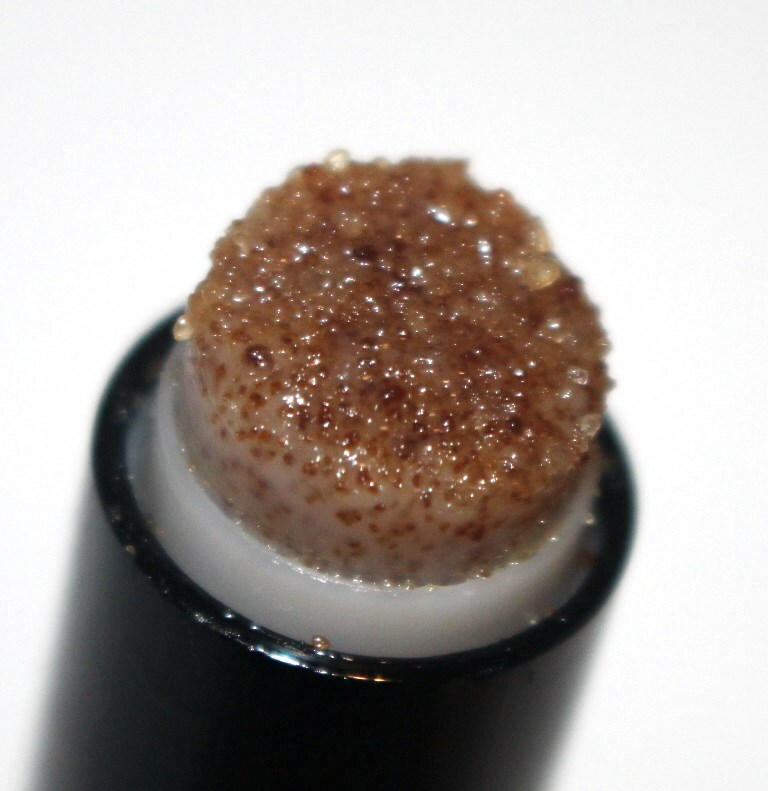 The lip exfoliator comes in a typical plastic lipstick case with pull off protective lid and wind up applicator that gets rubbed straight onto the lips. 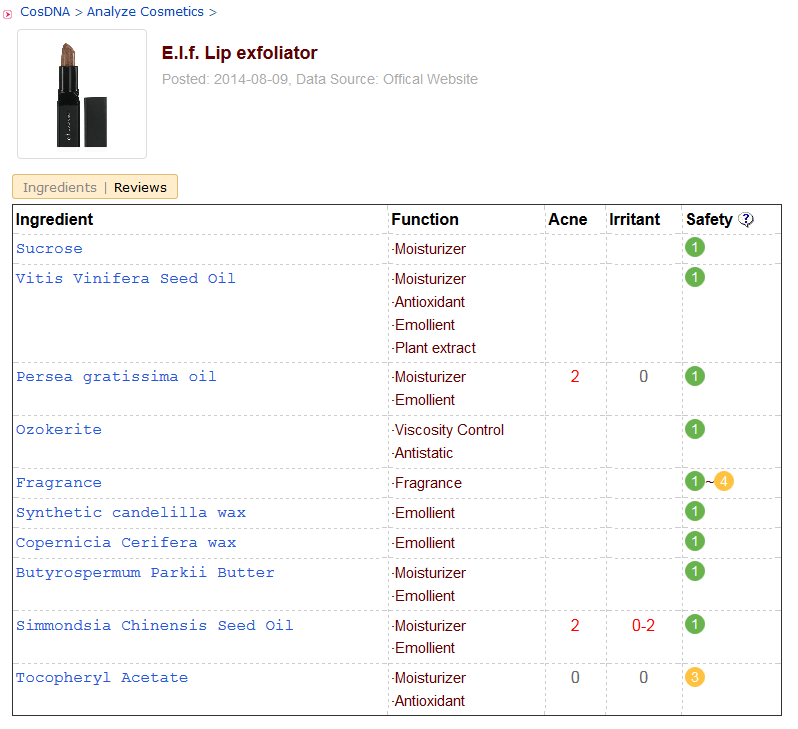 The CosDNA analysis and EWG Cosmetics Database, rate the ELF lip exfoliator favourably with no red flags raised against any of the included ingredients. 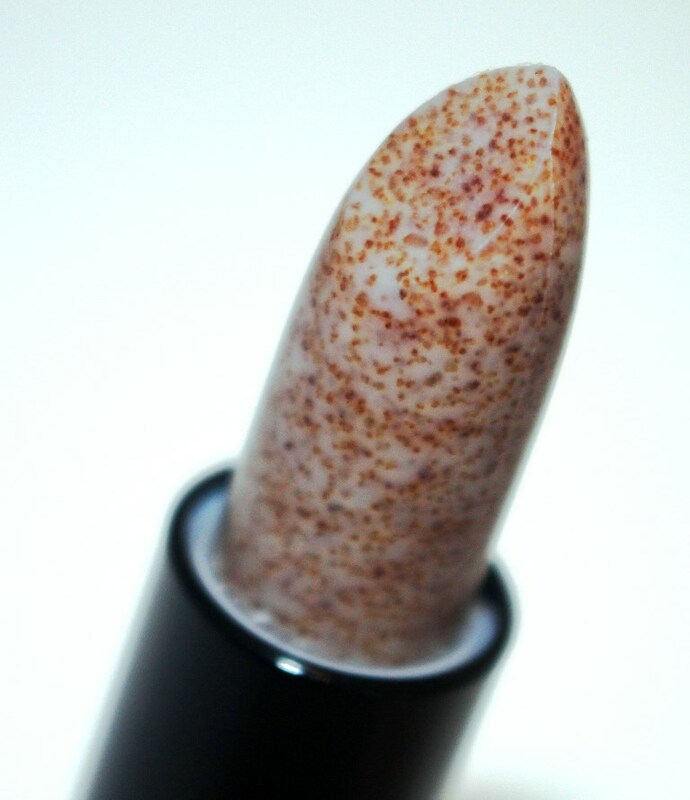 Gently rub the tube over your lips in small, circular motions. Wipe gently with a cotton pad and follow up with a nourishing lip balm. As you might expect, this product smells sweet like sugar. 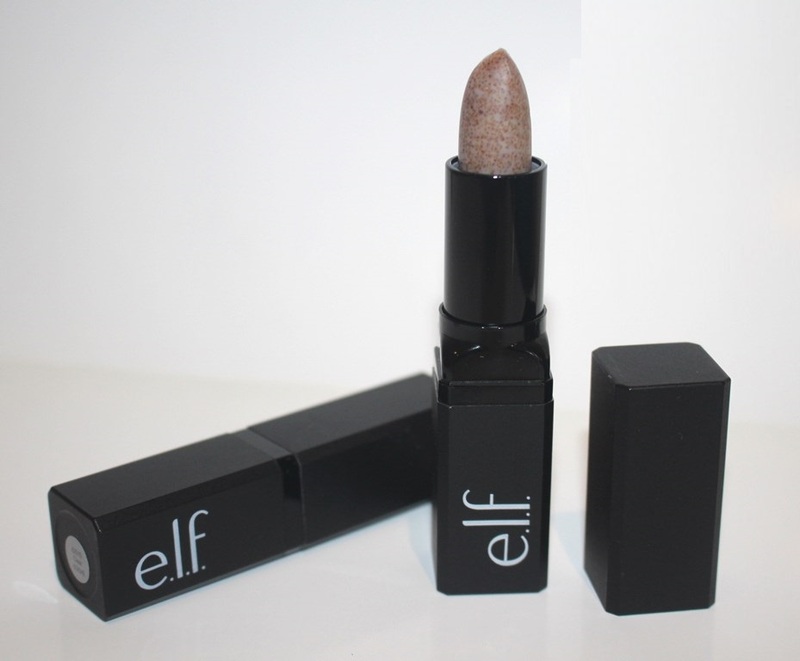 The ELF Lip Exfoliator sells for AUD$9.00 for a standard lipstick sized product. 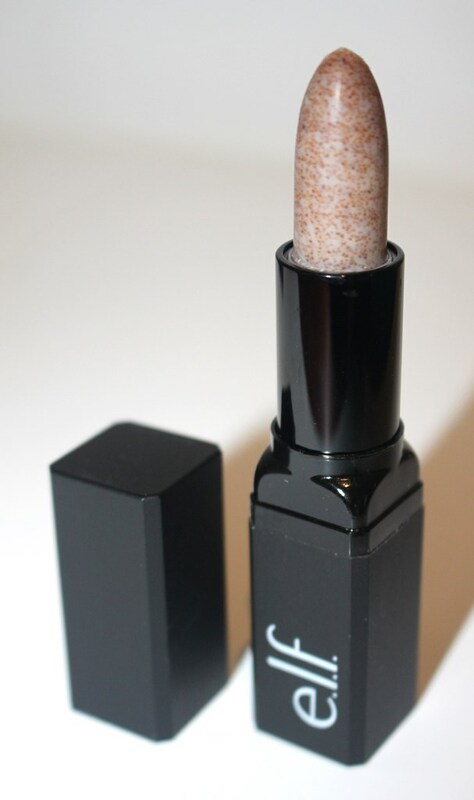 The lip exfoliator is available from the ELF website, online beauty stores, ebay and some department stores such as Kmart. The products lasts 12 months after opening. This is an effective and non-toxic product which is particularly good considering it is applied on the lips. I have tasted this as a result of residue on my lips and it didn’t do me any harm. As expected, it was sweet, like sugar! The natural oils give it a glossy shine and do the moisturising whilst the chunky granules of sugar perform exfoliation. It is far rougher than any physical face exfoliator. Circling over the full lip area with a small amount of force delivers really smooth lips as the surface becomes fresh, clean and radiant. Applying it like lipstick won’t give an effective treatment. Of course, you don’t have to push until you bleed to get a good result either. You soon realise how much pressure to apply when using it. If your lips don’t feel soft afterwards, then you’re probably not applying enough force, however, if they’re sore or bleeding, then ease up. Applying it straight onto your lips may not be the most hygienic means, but it certainly is the most practical given the target area. Just as we apply lipsticks directly, I see no problem with doing the same here. Furthermore, this product wears down much faster than a regular lipstick. With 2-3 uses a week, it will last say 1-2 months (depending on your style of application and therefore amount used), so there is little time available for harmful bacteria to form anyway. The exfoliator comes in several flavours including regular (as featured in this review), pink grapefruit, coconut, sweet cherry, mint maniac and rose, although only regular, sweet cherry and mint maniac are currently sold in Australia. ELF products are much cheaper in the US. This lip treatment is sold for only US$3.00 on the American ELF site, less than half the price we pay on the Australian equivalent (AUD$9.00). However, I have found that online stores will often be cheaper, especially when they source their product from the US. Add to that free shipping with a minimum spend and it makes sense to simply order online and enjoy the savings. Alternatively ELF Australia will often have store wide percentage off sales, sometimes as much as 50% so look out for these if ordering locally too. As you can see from the photos posted, I have a brand new lip exfoliator and one that is almost finished so I have already gone out and repurchased confirming, I like it! It is effective, easy to use, highly portable, comprising safe ingredients and relatively inexpensive. What’s not to like?